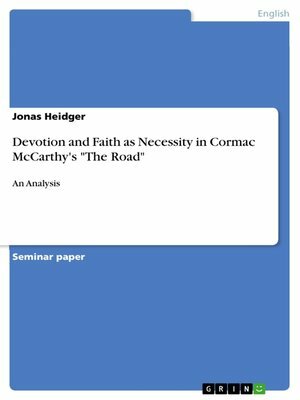 Devotion and Faith as Necessity in Cormac McCarthy's "The Road"
Seminar paper from the year 2015 in the subject American Studies - Literature, grade: 2,1, Johannes Gutenberg University Mainz, language: English, abstract: In this paper I argue that aspects such as devotion and faith are needed to maintain a positive attitude towards morals and hope in a post-apocalyptic setting. The novel "The Road" begins about ten years after a catastrophe has shocked the world's core, leaving it thinly populated by the wandering remnants of humanity, who instinctively seek for food in a primal quest, thus testing their survival skills and instincts. "The Road" tells the story of a father and son who travel through a destroyed landscape and who are brought to their limits concerning their faith, morals, and their endurance of believing in the true good of humanity. The two characters are followed by the reader on their journey through post-apocalyptic America, seeing that most survivors have turned into cannibalistic savages, who abandoned any kind of moral and therefore would do anything to survive. The contrasting image of these savages is the Man and his son, still following a moral code, although, the father does not follow it as strictly as the son does. But in an environment like this, where people do whatever it takes to survive, having morals and values leads both characters into dangerous situations, yet they pursue to their believes that they are the "good guys" in a world full of "bad guys", to bear up under the monumental burden of merely carrying on in a world.